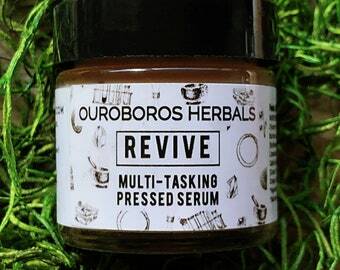 Announcement Welcome to Ouroboros Herbals! We hope that your experience with our creations turns your routine into a self-care ritual. Available on all items . Use code "ELCORTE" upon checkout to avoid shipping charges and pick up in person. We will notify you when your order is ready. The pickup location is at El Corte (BarberShop), 105 Pomarrosa St., San Juan PR 00911. 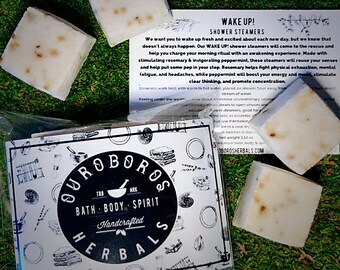 Welcome to Ouroboros Herbals! 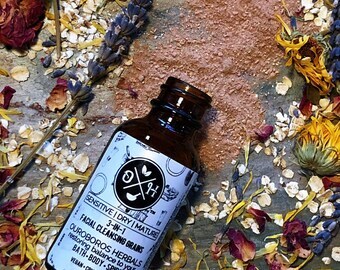 We hope that your experience with our creations turns your routine into a self-care ritual. I love this product. It smells amazing, perfect for a shower after a long day of work. Leaves your skin refreshed! Love this item! So refreshing and even my husband enjoys them added to his showers ! All items are on sale now through Saturday! Shop our Bath, Body, and Spirit collections with no code necessary. If you’re a local, you can use code “elcorte” at checkout and save on shipping. We’ll let you know when your order can be picked up. Excited to finally share REVIVE with you! Check out our newest addition. It’s a multi-tasking pressed serum that serves as both a cleanser and a serum + moisturizer combo. Only two sizes left! We’ve sold out of the Med. sized bar. Thank you guys! 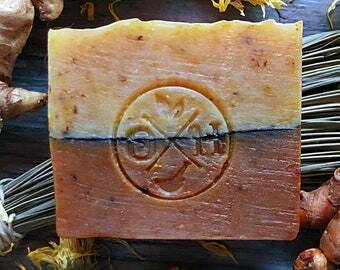 Video summary: Prepping seasonal Pumpkin Chai Soaps to cure for Fall 2018. I find inspiration in Mother Earth and all that she provides for us. As an energy worker, the long history of women healers, along with the origins and wisdom of natural healing, awaken something deep within me. 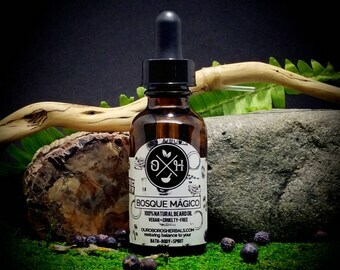 I have combined these loves with my formal studies in Organic Skincare Formulation and my ongoing studies in Advanced Organic Cosmetic Science to share OUROBOROS HERBALS with you. 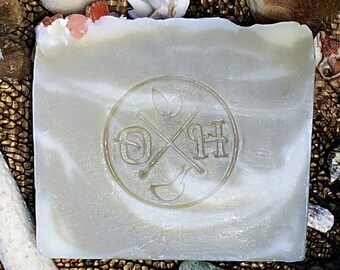 I personally design, formulate, handcraft and package each one of our creations and charge them with positive Reiki energy & pure intention before I lovingly send them your way. I hope that you enjoy our creations as much as I enjoy making them for you. I have the heart of an alchemist and am happiest when creating. Barber by trade, but an artist at heart. Find OuroborosHerbals at the following upcoming market! Email marketing (if applicable): With your permission, we may send you emails about our store, new products, and other updates. We will never send you anything unless you sign up to our mailing list, we promise! If after you opt-in, you change your mind, you may withdraw your consent for us to contact you, use or disclosure of your information, at any time by contacting us or opting out directly at the bottom of our emails. What do we do with your information? Email marketing (if applicable): With your permission, we may send you emails about our store, new products, and other updates. We will never send you anything unless you sign up to our mailing list, we promise! How do you get my consent? When you provide us with personal information to complete a transaction, verify your credit card, place an order, arrange for a delivery or return a purchase, we imply that you consent to our collecting it and using it for that specific reason only. If we ask for your personal information for a secondary reason, like marketing, we will either ask you directly for your expressed consent or provide you with an opportunity to say no. How do I withdraw my consent? If after you opt-in, you change your mind, you may withdraw your consent for us to contact you, use or disclosure of your information, at any time by contacting us or opting out directly at the bottom of our emails. Available upon request. We do not formulate for private labels. Orders are usually processed fairly quickly (within 1-4 business days), but during holidays and on rare occasions it may take up to 7 business days. Ouroboros Herbals is not affiliated with the FDA. Our products are not intended to diagnose, treat, cure, or prevent any disease. Ouroboros Herbals is not responsible for the misuse of its products or for any injuries, damages, adverse reactions, or losses resulting from their use. Our magickal descriptions are for curio only. By purchasing our products you accept these statements & release Ouroboros Herbals from all liability. We encourage you to read our product descriptions, research ingredients, and do a skin test to ensure that you are not sensitive to any ingredients. Discontinue use if irritation occurs. Feel free to contact us should you have any questions about the ingredients in our products or requests. 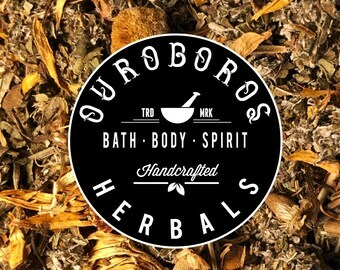 Ouroboros Herbals uses natural, nature-identical or derived from natural ingredients. 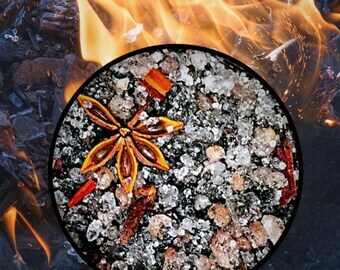 We use pure essential oils to scent and/or add certain beneficial properties and may use other natural materials such as clays and/or roots to obtain a desired color or texture. Our products are lovingly handmade in small batches. Some variations may occur in a product's appearance, this is normal and is to be expected. Our products are designed for adult use and we strongly discourage using them on children and/or pets as they may cause sensitivities or reactions depending on their age, skin and other factors. The essential oils used have been diluted in our products to comply with adult use unless otherwise stated. We recommend consulting a doctor if you are unsure about using certain products on your children or pets. Pure essential oils are highly concentrated substances extracted from plants. It is safe to use some essential oils while pregnant or breastfeeding, but we advise that you should consult your doctor beforehand. Please read our product descriptions and feel free to contact us if you are unsure about any specific ingredients in our products. We want you to be happy with your purchase. If your order arrives with physical damages or you have received the wrong item, please CONTACT US WITHIN TWO (2) DAYS of receiving said order and provide proof in the form of a picture of the item(s). We will be more than happy to help resolve these issues by offering a store credit or a refund in accordance with the situation. We do NOT accept returns or exchanges under any other circumstances other than 1. Item(s) arrived with physical damages or, 2. We made a mistake on our part and sent you the wrong item(s). Ouroboros Herbals does not pay any customs duties/taxes or fees. Customs duties/taxes and/or fees may vary and are the sole responsibility of the buyer. We accept no responsibility for these. If you refuse to pay these fees you are also refusing your parcel. If this happens, the shipping provider may destroy your parcel. We cannot be held accountable for any packages destroyed by shipping carriers and your order will not be refunded. If you contact the shipping carrier and refuse your parcel, they might let us know this.